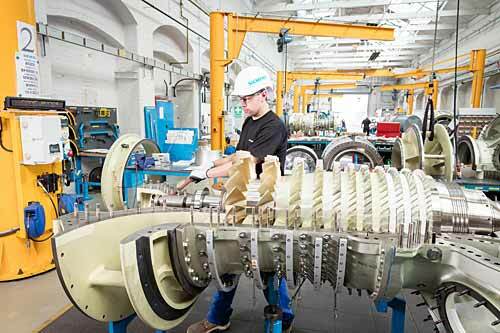 Siemen’s Dresser-Rand business has received an order from Egypt-based Belayim Petroleum Company (Petrobel) for three model SGT-400 industrial gas turbines, including associated electrical generators. The total order value is in the double-digit million euros range. Petrobel, a joint venture formed by Italian oil and gas company, Eni, and Egypt’s General Petroleum Corporation (EGPC), is developing the Zohr gas field, located about 200 kilometres off Egypt’s Mediterranean coastline. The order scope also encompasses a service package that includes spare parts supply and on-site maintenance. The turbine-generator sets are slated for delivery in early 2017. The SGT-400 turbines, manufactured at the Siemens operation located in Lincoln, England, will be integral to the supply of electric power to the natural gas processing facility currently under construction. Each of these turbines is rated at an ISO-based electrical generating capacity of 12.9 megawatts (MW). The SGT-400 model is considered the most efficient gas turbine in this performance class. This high efficiency lowers fuel consumption and thus operating costs, and enables the operator to sell more gas to its customers. Furthermore, the additional quantity of electricity generated provides greater flexibility should plans call for an increase in the gas processing facility’s production capacity.